This month’s Island Batik challenge is to make a quilt with interesting borders and / or bindings. If you have been following my Island Batik journey from the beginning, February 2017, you may remember my reaction when I pulled the Dotalicious Fire Island Batik strips with yellow and purple coordinating fabrics out…I knew right away I wanted to make my Mango Mix pattern. I was hoping it would work for one of the challenges. This is it! Here is a photo of the fabric I was given in my first Island Batik box and my original Mango Mix pattern…. I have the seniors who quilted with me in Holliston, MA to thank for this design. 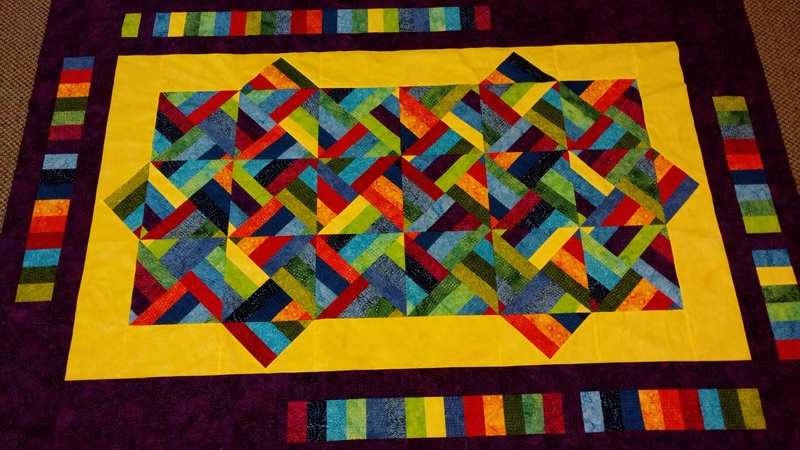 They challenged me to design a quilt that used all 40 strips from a pre-cut strip set. Challenge accepted, and I was determined to effectively and efficiently use all 40 strips. I did it! What was so exciting about this pattern is there is very little matching. The secret to success with this pattern is bold contrasting borders. Here’s the first step…Stitch 10 sets of four fabrics together. Now the interesting thing about this pattern is that the borders are easy and effective. The first border has six triangles stitched in. 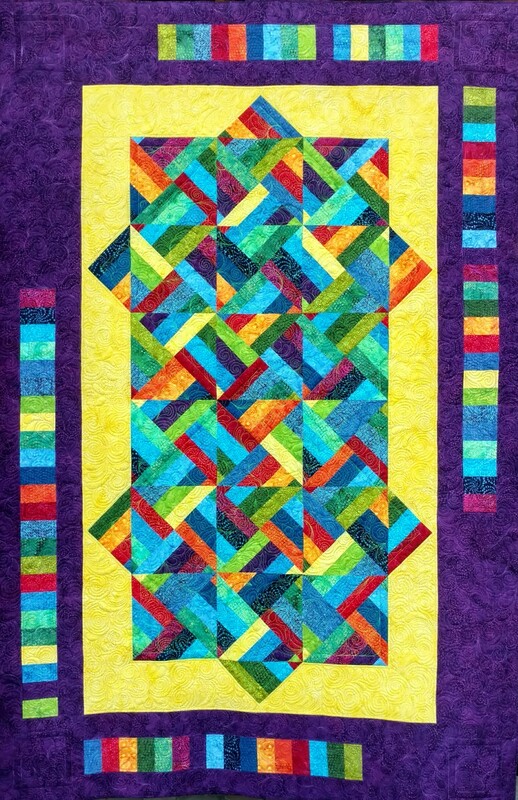 The second border has 4 1/2″ sections left over from cutting the blocks from each strip set. Sometimes I add a flange around these sections before creating the border strips. Here’s what it looked like before quilting. If I had just a bit more fabric, I would have added an eyelash binding. It would have had a small strip of yellow peeking out between the purple border fabric and the purple binding. 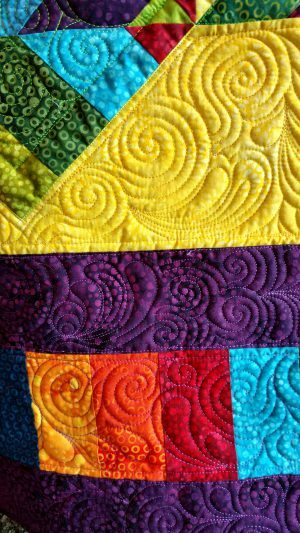 Sometimes there is enough going on in your quilt and a simple, plain binding looks best. After Making the Mango Mix pattern several times, I decided to reinvent it. Although I have always liked it, I felt that it needed to be wider to look better on beds. I widened the inner border to 8″ and the out border to 10 “. I call the new pattern, “Mango Re-Mix”. It is available HERE. Here’s photo of a Mango Re-Mix quilt done with some green batiks I had in my stash. 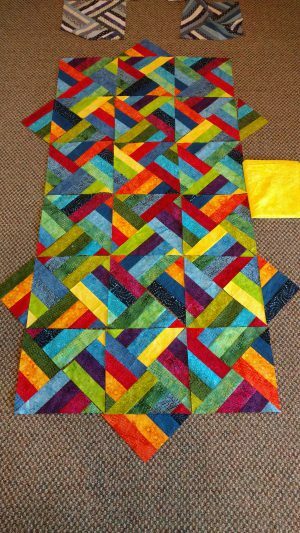 This pattern is fast and fun and makes a beginner quilter look more advanced. There are so many ways to quilt this quilt. I’ve seen pantographs, all over designs, and intricate lines and feathers. This green one has three fish hooks with worms, 5 fish, and lots of curves quilted in. I hope you have fun stitching a Mango Mix or Mango Re-Mix sometime soon! This entry was posted in #creativebordersandbinding, classes, finished project, free motion quilting, Island Batik, Uncategorized and tagged #creativebordersandbinding, free motion quilting, Island Batik. Bookmark the permalink.